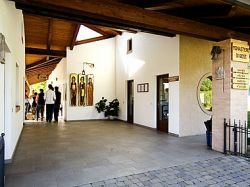 To contact the guest house of the monastery and to have information about the stay at Bose, please make a phone call or send a fax! please use e-mail only to request information. In your e-mail message, remember to write your name and surname, your address, and your telephone number. from Monday to Saturday, exept Saturday evening; for the rest of the day the answering machine is on with the possibility of leaving messages.